. Published on March 20, 2018 . The bindery on a grey morning (my apologies, this photo doesn’t do it justice). The truth is I haven’t left the house in two days, this afternoon I’ll force myself to take a break and go to the grocery store to stock up on essentials for the week. At some point yesterday I started writing numbers and then stars next to my to-do list in an attempt to prioritize and then re-prioritize. You must know what all this means. IT’S MIDTERMS! Most of my classes have fairly evenly spaced assignments throughout the semester, so I don’t have any huge midterm exams that my grade rests on. Instead midterms are a lot like spinning plates, constantly in motion hoping nothing falls. As of now, all plates are in the air and everything seems to be spinning, we’ll see how the rest of the week goes. Not all of my classes follow the typical 15 week semester schedule. 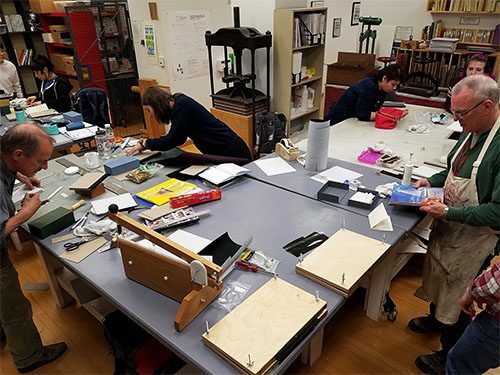 I’m currently taking a 5 week book binding class with the legend, Brad Freeman. It’s a long class, meaning that it meets once a week for an eight hour session. But it is really nice to have such dedicated amount of time to work on binding, it fits the technical skills we are developing nicely. At first an eight hour class feels daunting, but it’s broken into sections that allow for a natural flow to the day. At the start of class we discuss and critique the books we made as homework the previous week. 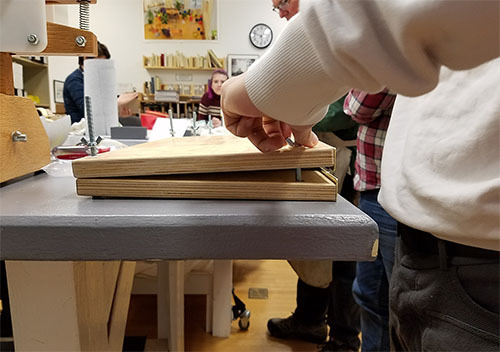 We discuss the challenges we encountered in our making process and share solutions or tips we may have. Next, Brad shares a variety of related artist books that are relevant to the binding structure we will focus on for the day. Finally, we use the remainder of class to learn the new structure through step-by-step instruction. I’ve really enjoyed the conversations with my classmates so far. The process of working through each binding structure at the same time means we inevitably end up chatting a lot in between steps. I really enjoy everyone’s humor and the topics we cover, subsequently we’ve developed a camaraderie over a short period of time. During my first year I took an Artist Books class, so many of the binding structures aren’t brand new to me. But, it’s been a great refresher that’s allowed me time to think about what I want my final book project to be. I’ve been interested in working with remixing technical texts and I’ve become completely fascinated with learning about code this semester. I’m not sure exactly how these interests will play into my final piece, but it looks like I’ll be figuring it out soon enough. Also, it should be noted that this class is held in my very favorite classroom at Columbia. 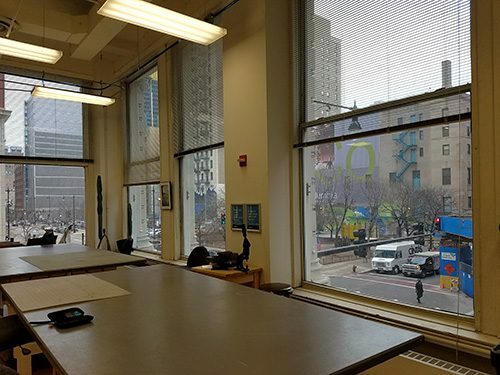 The Bindery is a amazing space with gigantic windows that flood the class with natural light every class. Even on grey winter days this room is an inspiring place to work. 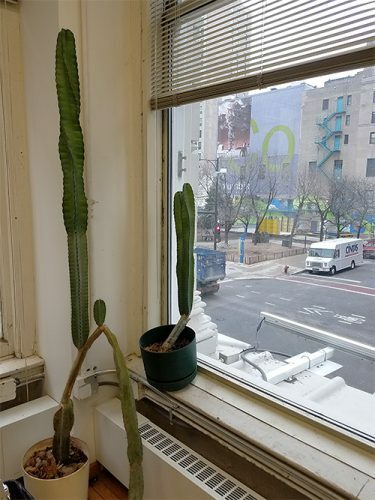 It’s also home to a truly magical cacti that have clearly been through some serious trials and tribulations only to survive—a worthy inspiration for all grad students!